Welcome to the Finance Department at Kendall Toyota of Fairbanks, your leading resource for car loans in Fairbanks, used car loans, and Toyota leases. In addition to unparalleled and personalized customer service, we finance new and pre-owned Toyota cars, trucks, and SUV’s. We also provide trade-in assistance, no-obligation car appraisals, and car loan modification at our Fairbanks Toyota dealership. Visit us in person today at Kendall Toyota of Fairbanks and we’ll help secure an affordable auto loan or lease perfect for your budget. We are only a short drive away from the areas of North Pole, Fort Wainwright, and Delta Junction, Alaska at 1000 Cadillac Ct in Fairbanks, AK 99701-4380. In the meantime, if you have any questions whatsoever please don’t hesitate to give us a call or contact us online. Low-interest Fairbanks car loans are available for customers with existing loans. We can help you refinance your car loan or adjust the terms of your current contract. At Kendall, we believe that everyone deserves to have reliable transportation with a comfortable loan or Toyota lease to finance their vehicle. You’re only a few steps away from approved car financing! Begin by browsing our wide selection of new Toyota dealership inventory and our extensive inventory or used cars in Fairbanks. If you have any difficulty finding what you are looking for or have any questions whatsoever, please don’t hesitate to give us a call or contact us online. When you find the Toyota car, truck, or SUV that you’re looking for, head on over to our convenient online car loan calculator and find out an estimate of your future auto loan payment. Now you’re ready to apply for an affordable Fairbanks car loan! Simply fill out our online auto finance application at your convenience from the comfort of your own home. You can also find out the value of your current used vehicle using our simple online trade-in value estimator. This simple form will provide you with the true market value of your vehicle and present you with an opportunity for a no-obligation car appraisal from one of our Kendall appraisal experts. With the right information, you can then make an informed decision about selling your current used vehicle to Kendall or to another party. 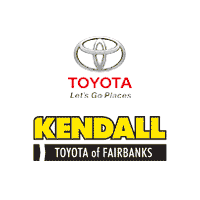 Thank you for visiting the Finance Department here at Kendall Toyota of Fairbanks. We appreciate your patronage and time spent learning about our different services. Come see us soon at Kendall and let’s start something great!